Aberdeen captain Graeme Shinnie has been pictured at Derby County as he holds talk over a possible move to the Championship club. 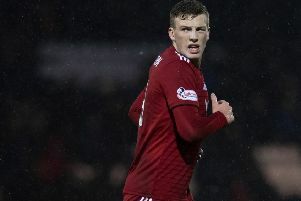 The Scottish international is out of contract at the end of the season and has so far kept his options open as Aberdeen look to tie him down to a new deal. Rangers are another club who’ve been credited with an interest in the midfielder, who can also play at left-back. It now appears, though, that the Ibrox side could be beaten to the punch with Derbyshire Live reporting that Shinnie is down in the Midlands for signing talks. The 27-year-old is suspended for Sunday’s Scottish Cup semi-final clash with Celtic after passing the bookings threshold in the 2-0 quarter-final victory over Rangers.